Police have issued a fetching self-portrait of a man who was caught on the miniature camera he put in the ladies changing room of a Cheshire supermarket. 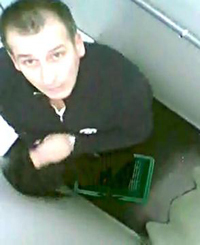 A police statement explains: "Police in Warrington are keen to trace a man who placed a small camera in a fitting room at Asda in the Westbrook centre in Warrington on December 19 at around 5pm. The device was placed in the light fitting and was in place for 30 minutes before it was discovered. "Unfortunately for the man, he forgot to turn off the camera whilst placing it, and forensic examination of the data card shows him placing it in situ."